If-anybody-about purchasing costly watches or latest trend watches then why don’t move to buy and experience new revolution Wrist-Wearable Smartwatch. 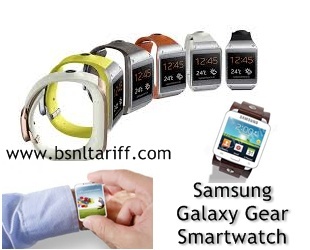 Leading Handset seller in India ‘Samsung’ has launched its new innovative version ‘Galaxy Gear Smartwatch’ compatible connectivity with Galaxy Note 3 and Galaxy Note 10.1 over Bluetooth models. The battery life, challenge for most wearable devices, weighing at 168grams, 8.33m wide, lighter and slimmer than its predecessor. Company announced new version smartwatch comes with 70 apps initially it can make calls, display messages, record videos and snap photos with its 1.9 megapixel camera and it will arrive on Indian retail shelves on September 25. Model colors available in Jet black, mocha gray, wild orange, oatmeal beige, rose gold, and lime green.